JMA reported that the number of earthquakes with shallow hypocenters and epicenters near Ponmachineshiri Crater, a summit crater of Me-Akan (also known as Meakan-dake, which means Meakan Peak) of the Akan volcanic complex, increased at 1800 on 20 November. Another seismic increase occurred on 23 November, in number and amplitude of events, prompting JMA to raise the Alert Level to 2 (the second lowest level on a 5-level scale). Although Akan is the most active volcano on the island, little activity has been reported by JMA since November 2008; activity during 2008 was summarized in two previous Bulletins (BGVN 33:10 and 35:10). Since then quiet prevailed except for a few instances of tremor in 2009 and 2010 reported in Japan Meteorology Agency's (JMA) monthly summaries from September 2010 to November 2012. The caldera is located in Akan National Park on the island of Hokkaido, Japan (figure 11). Figure 11. The location of the Akan volcano complex (a caldera with multiple cones) on the Japanese island of Hokkaido. Courtesy of Google Maps. 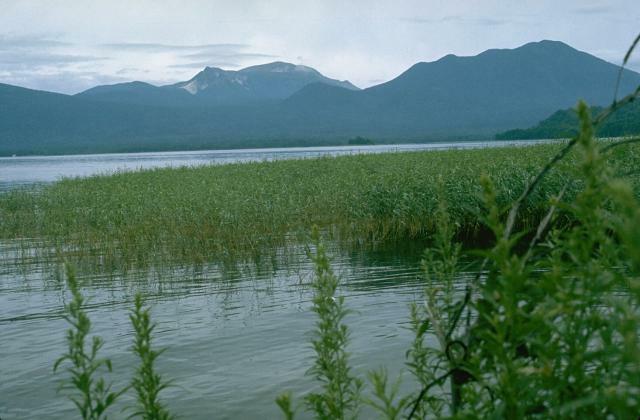 The Me-Akan volcano group, E of Lake Akan, is the only site of historical activity in Akan caldera. Me-Akan is composed of 9 overlapping cones; the main cone contains three prominent craters, the Akanuma crater, 96-1 crater, and "old crater" (figure 12). Figure 12. An aerial photo taken on 17 April 2009 looking from the N of the Me-Akan cones. (a) The main Me-Akan cone hosts three craters (labled in red): 96-1 crater, steaming in the upper center; below it to the left, old crater; and adjacent to old crater to the right, Akanuma crater. (b) The same image without captions. Courtesy of Keiji Wada and JMA. "Tremors with small amplitudes were observed four times from 12am to 10pm on 17 December . No remarkable changes in plume, infrasonic and tilt data were observed during the occurrence of these tremors. The previous tremor was observed on 18 March 2009. Seismic activity has returned to the background level, after a temporal increase of volcanic earthquakes with small amplitude during 17 December through 19 December. According to the observation by Kakioka Magnetic Observatory of JMA, geomagnetic total intensity at Meakandake [Akan] has been increasing since July 2009, which reflects the cooling process beneath the south slope of 96-1 crater, and its trend has been declining since July 2010. No remarkable changes in both plume activity and crustal deformation were observed." Since the Me-Akan complex, part of a 13 X 24 km elongated caldera, lies within the Akan National Park (figure 13), JMA not only monitors the complex, but as well produced safety and evacuation procedures for the visitors. The JMA prepared both a hazard alert map (figure 14), and volcano hazard and evacuation procedure poster (figure 15). These are available at Lake Akan and Lake Kussharo-ko, hot springs, nature sites, and accommodations. Figures 14 and 15 meet the needs of those visitors unfamiliar with the nature of volcanoes, hot springs and calderas. In the form of a cartoon (infographics), the latter helps those with little or no knowledge of the Japanese language. Figure 13. Akan volcano on Mt. Me-Akan (Mt. Meakan-dake). Note Lake Akan (Lake Akan-ko), roads, rail lines, and density of tourist facilities and travel near the volcano complex. Courtesy of Secret-Japan.com. Figure 14. JMA hazard map for the active Me-Akan cone (in Japanese). Courtesy of JMA. Figure 15. JMA cartoon of Akan volcano hazard and evacuation information (chiefly in Japanese with several English translations). Courtesy of JMA. Information Contacts: Japan Meteorological Agency (JMA), Otemachi, 1-3-4, Chiyoda-ku Tokyo 100-8122, Japan (URL: http://www.jma.go.jp/); Keiji Wada, Hokkaido University of Education, Hokumon-cho 9, Asahikawa 070-8621, Japan; Google Maps (URL: http://maps.google.com/); Secret-Japan.com (URL: http://www.secret-japan.com/). JMA reported an eruption from Me-Akan (also known as Meakan-dake, which means Meakan Peak) of the Akan volcanic complex on 28 November. Ash plumes rose to an altitude of 2 km (6,600 ft) a.s.l. and drifted N, E, and SE. Ash was deposited on the E flank up to 4 km away from the crater. The Alert Level remained at "near-crater warning" (levels 2 and 3 on a 5-level scale). On 17 November, JMA raised the Alert Level for Me-Akan (also known as Meakan-dake, which means Meakan Peak) of the Akan volcanic complex to "near-crater warning" (levels 2 and 3 on a 5-level scale) after the seismic network detected tremor that lasted 171 minutes. On 18 November, the summit was obscured by cloud cover but web camera views showed that the snow-covered S slopes had turned black. During an overflight later that day, JMA scientists noted that the ash covered an area up to 400 m away from Ponmachineshiri crater. Ballistic lithics several tens of centimeters in diameter were deposited around the crater. On 17 October, JMA lowered the Alert level for Me-Akan (also called Meakan-dake, which means Meakan Peak) of the Akan volcanic complex from near-crater warning to normal. Seismic tremor was no longer detected after 30 September, and seismicity had remained low after 3 October. A very small eruption occurred at Me-Akan (also called Meakan-dake, which means Meakan Peak) of the Akan volcanic complex on 21 March. Tremor began around 0628, the eruption apparently began around 0637, and an alert was issued by JMA at 0643. The eruption occurred from the volcano's NE flank. Ash was deposited on snow as far as 10 km SE of the volcano. The volcano is in a remote area and no populated areas were threatened. Me-Akan last erupted in 1998. On 21 March a strong (M 6.9) earthquake occurred near Urakawa, off the S coast of Hokkaido and 182 km SW of Akan. Local seismicity at Me-Akan increased after the earthquake, but the JMA has reported that there is no evidence of a causative relationship. The total number of seismic events recorded in March was 411 (table 1). The numbers of recorded seismic events at Me-Akan for 1977-81 are 97, 45, 491, 254, and 194. Table 1. Number of seismic events recorded at Me-Akan during 19-31 March 1982. Courtesy of JMA. Local seismicity gradually declined, returned to its usual level by mid-April (figure 1), and has remained there through July. Monthly numbers of recorded seismic events are: March, 411; April, 92; May, 16; June, 54; and July, 16. Figure 1. Daily number of recorded seismic events at Me-Akan, March-April 1982. Courtesy of JMA. Minor eruptive activity occurred at Me-Akan cone between the evening of 5 January and the next morning. The eruption caused minor flank ashfall. Volcanic earthquakes had increased sharply in December and weak volcanic tremor occurred 4-6 January. Ash-darkened snow near the summit of Me-Akan-dake was reported by Kushiro Local Meteorological Observatory staff on 7 January. The ashfall area stretched 2,000 m NE from Ponmachineshiri Crater and was 900 m wide. The ashfall was presumed to have resulted from an eruption that began the evening of 5-6 January. Continuous tremor of low amplitude was recorded from 1715 on 4 January through 0300 on 6 January . . . .
Fumarolic activity at Ponmachineshiri Crater had been noted by a field survey in May 1987 and fumarole temperatures began increasing in July. Earthquake swarms have occurred frequently since December when the monthly total of recorded earthquakes reached 394. Me-Akan-dake cone erupted during the nights of 7-8 and 18-19 February. A slight ashfall was observed on fresh snow at the E foot of the volcano during a field survey on 9 February. Ashfall was next observed on snow near Lake Akan, 9 km from the summit, on 19 February. Higher amplitude volcanic tremor was recorded during both eruptive episodes . . . . Only seven discrete earthquakes were detected in February, down from 37 in January. Earthquake swarms had been frequent since December . . . .
After small ash eruptions in January and February activity declined in March. However, steam emission was continuous, with the highest plume rising 500 m above the crater on 9 March. The number of volcanic earthquakes increased sharply on 18 October. A seismograph . . . registered ~300 events on the 18th and 150 the next day. The month's total of 800 events was the highest since observations began in 1973. No change in vapor emission was evident. A small white plume continued to rise 100-150 m from Me-Akan-dake's crater. The number of earthquakes . . . increased in late January and again in late February. Earthquakes had been gradually decreasing since a seismic high in September 1989 (figure 2). Seismicity again increased suddenly on 6 June then decreased through 8 June (the date of this report). Steady steam emission continued unchanged at the summit. Figure 2. Daily number of recorded earthquakes at Akan Caldera, 1973-June 1990 (top). Arrows mark eruptions. Detail showing daily recorded earthquakes, January 1989-June 1990 (bottom). Courtesy of JMA. The number of earthquakes . . . increased in late January and again in late February, after a gradual decrease that followed a seismic high in September 1989. Seismicity again increased suddenly on 6 June, then gradually decreased toward the end of the month, but remained higher than its usual level. Steady steam emission continued unchanged at the summit. The October total of recorded earthquakes was 202, an increase from 144 in September. Steam emission remained unchanged, reaching 600 m height during October. Seismicity has been at high levels for the last 3 years, since the eruption of January-February 1988. A total of 158 recorded earthquakes in November represented a decline from 202 the previous month. Steam emission appeared unchanged, with plumes reaching 400 m height. Seismic activity was at similar levels in early December. Seismicity continued to decrease in December, with 94 earthquakes recorded . . . . Steam emission remained unchanged, with plumes reaching ~500 m. Activity continued at similar levels through the report date, 14 January. Seismicity has remained vigorous since the January-February 1988 eruption (figure 3). Figure 3. Monthly number of earthquakes at Akan, 1973-90. Arrows mark eruptions. Courtesy of JMA. A total of 183 earthquakes was recorded in January . . . . Steam emission appeared unchanged, with plumes reaching 300 m height. Similar activity was noted in early February. A total of 140 earthquakes was recorded in February . . . . Steam emission appeared unchanged, with plumes reaching 500 m height. Earthquake activity began increasing on 22 September, peaking on 2 October with 146 recorded events (figure 4), then gradually decreased to a background of 1/day by 9 October. No shocks were felt. Epicenters were presumed to be at or near the active (Ponmachineshiri) crater. Seismicity at the volcano has been low since March 1991. Figure 4. Monthly number of earthquakes recorded at Akan, 1973-92. High seismicity occurred in late September after 1.5 years of quiet. Courtesy of JMA. Seismic activity increased from 22 September, peaking at 186 earthquakes/day on 2 October (17:9). Seismicity then gradually declined to background levels of 1/day by 10 October. Activity resumed on 27 October with 10-20 events/day continuing through mid-November. None of the earthquakes were felt. Epicenters for the earthquakes were presumed to be at or near the active crater. Surface activity remained unchanged, with white steam rising to a few hundred meters. Seismic activity . . . remained at relatively high levels through November. The monthly total of  shocks was down from 546 in October (figure 5); none were felt. Surface activity remained unchanged, with white steam rising to a few hundred meters. Figure 5. Number of recorded earthquakes during 10-day periods at Akan, 1985-92. Arrows mark phreatic eruptions in 1988. Courtesy of JMA. Seismic activity, high since 22 September, declined in December. Only 21 earthquakes were recorded . . . . Surface activity remained unchanged, with white steam rising to a few hundred meters. Microearthquake activity began to increase on 27 March and continued through April before declining in May. The monthly earthquake total for April was 295, far more than the background level of 10-20. Steam emissions remained steady with no observed changes. Slightly higher seismicity . . . persisted in May. No changes were observed in the steady steam emissions. Seismicity increased after 15 August. On 18 August, 127 events were recorded 2.3 km from Ponmachineshiri Crater on Me-Akan volcano. The total number of earthquakes in August was 363. High seismicity was previously reported in March-April 1993. During September, Me-Akan was the site of elevated seismicity and limited tremor. The monthly total number of earthquakes was 252 at Station A, 2.3 km NW from Ponmachineshiri Crater. The highest daily number of earthquakes, on 10 September, was 19. On 13 September a volcanic tremor occurred for one minute duration. Seismicity during October, and thus far in 1995, remained slightly higher than was typical for the past several years (figure 6). The highest daily number of earthquakes during the month took place on 2 October and consisted of 33 events (recorded at Station A, 2.3 km from Ponmachineshiri Crater). The monthly total for October consisted of 395 events. Figure 6. The number of daily earthquakes at Akan's station A, 1 January 1987 through October 1995. Courtesy of JMA. On 1 November there were 46 earthquakes recorded, and small amplitude volcanic tremor continued for ~2 minutes. High seismicity continued through the 5th with 18-28 events/day. The November earthquakes totaled 643. Volcanic earthquakes at Me-Akan stratovolcano increased after 21 August. On 26 and 27 August, there were 82 and 80 earthquakes recorded, respectively, daily highs for the month. A total of 490 earthquakes was detected in August. On the eve of 21 November a small phreatic eruption took place at Me-Akan. Prior to the eruption, JMA reported that volcanic earthquakes increased starting on 21 August (BGVN 21:08), decreased in the first half of September, and then increased after 28 September. Daily earthquake totals were 58 and 90 on 29 and 30 September, respectively. A total of 356 earthquakes registered during September. On 2 October 142 volcanic earthquakes took place. This sudden increase in seismicity prompted the Kushiro Local Meteorological Observatory to issue a Volcanic Advisory. Although the seismic activity began to decline on 3 October, a total of 324 earthquakes registered during October. The 21 November eruption was initially described by Yuichi Nishimura of the Usu Volcano Observatory via an electronic mailing list about Japanese volcanism. A relatively large volcanic earthquake, sufficiently robust to saturate the seismograph, occurred at 1755 that day. After that, JMA's Kushiro station registered eight minutes of small-amplitude tremor that decreased in amplitude with time. No shock-type air waves were observed associated with the first earthquake. Intermittent small earthquakes had also been noted. According to JMA, the total number of volcanic earthquakes on 21 November was 226, and in the morning of 22 November, 163. In contrast, in the afternoon of 22 November, there were only five earthquakes during the first three hours and none in the second three hours. Before and after the eruption tiltmeters did not show any detectable change. Ash issued in the November 21 eruption and collected near the town of Tsubetsu (~30-40 km N) was analyzed petrographically by Tadahide Ui and his colleagues at Hokkaido University. Several days later Ui reported finding no juvenile materials, a result in accord with a visual inspection from helicopter on November 22 that suggested the eruption was phreatic and no magma reached the surface. The plume in the afternoon of 22 November was white and only 200 m high, as low as the previous day before the eruption. On the afternoon of 22 November it was also learned that the eruption vented from the fourth crater of Ponmachineshiri, a feature that developed with three other craters during a 1955 eruption. The ash-covered area extended to the crater's N-NW and new tephra was visible 250-300 m to the S. Workers concluded that the phreatic eruption was as small as the 1988 Ponmachineshiri first-crater eruption. Information Contacts: Volcanological Division, Japan Meteorological Agency (JMA), 1-3-4 Ote-machi, Chiyoda-ku, Tokyo 100, Japan; Tadahide Ui, Earth & Planetary Sciences, Hokkaido University, Sapporo 060, Japan. According to observations from a helicopter on 12 and 19 December, fumes from a new vent were very active. Weak fumes were also observed from two new fumaroles in Crater 3 and Crater 4. In total, 137 earthquakes were recorded in December, but there were no volcanic tremors. On 9 November the Japanese Meteorological Agency (JMA) issued two "Volcanic Advisories" and a "Volcano Observation Report" following a small-scale eruption at Me-Akan volcano ~225 km E of Sapporo. New ash deposits were observed on trees in the nearby town of Akan, located E of the volcano near Lake Akan, and trace amounts of ash were distributed up to ~10 km E from the summit crater. JMA and Hokkaido University seismometers detected 4 minutes of tremor beginning at 1441 on 9 November. No additional earthquake or tremor events followed. According to the local news agency, Asahi Shinbun, one of their aircraft flew near the snow-covered summit of the volcano at approximately 0900 on 10 November. White-colored "smoke" was seen to rise 700 m above the Ponmachineshiri crater (figure 7). Observers also noted that snow fields up to 1 km S and E of the crater were gray in color. There were no reports of injuries or damage. Figure 7. 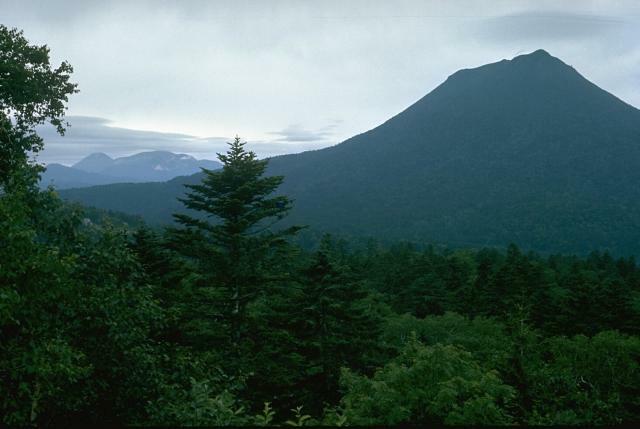 Summit view of Ponmachineshiri, part of the Me-Akan volcano group, [in 1996]. The water-filled Aonuma crater is in the foreground, First crater is center, and the smoking Fourth crater is on the right. Courtesy of JMA; photo by Keiji Wada, Hokkaido University of Education, Asahikawa. Researchers from Hokkaido University, the Geological Survey of Japan (Hokkaido Branch), Geological Survey of Hokkaido, and JMA (Sapporo and Kushiro) surveyed ash deposits from the 9 November eruption, and examined the ash under a petrological microscope. They estimated the total mass of the deposits as ~1,000 metric tons (t), smaller than the ~2,000 t eruption in 1996 (BGVN 21:10). The ash consisted of older, altered rock-fragments (andesite), minerals and clay. They found trace amounts of angular, fresh basalt fragments containing gray glass. They considered it likely that new magma reacted with water in a hydrothermal system, resulting in a phreatomagmatic eruption in which chips of solidified new magma were issued together with larger amounts of fragments of older rocks altered hydrothermally beneath the crater. Information Contacts: J. Miyamura, Japan Meteorological Agency, Kishocho-881, 3-4 Ote-machi, Chiyoda-ku, Tokyo 100-0004, Japan; Mitsuhiro Nakagawa, Department of Earth and Planetary Material Sciences, Graduate School of Science, Hokkaido University, N-10 W-8 Kita-ku, Sapporo 060, Japan; Asahi Shimbun News, Tokyo, Japan (URL: http://www.asahi.com/); Keiji Wada, Hokkaido University of Education at Asahikawa, Hokumoncho 9-chome, Asahikawa 070,Japan (URL: http://www.asa.hokkyodai.ac.jp/research/staff/wada/EV/E-Welcome.html); Volcano Research Center, Earthquake Research Institute (ERI), University of Tokyo, Yayoi 1-1-1, Bunkyo-ku, Tokyo 113, Japan (URL: http://www.eri.u-tokyo.ac.jp/VRC/index_E.html). Yukio Hayakawa of Gunma University notified the Bulletin staff that a very small eruption occurred on the morning of 21 March 2006 at Me-Akan. Tremor first started at 0628, followed by the eruption 0637. The Japan Meteorological Agency (JMA) issued a second-level alert at 0643. Ash was found on the snow at 10 km SE of the volcano. No towns or villages were threatened as the volcano is in a remote location, although there are some hot-spring hotels in the area. Me-Akan erupted in 1996 and 1998 from within the summit crater, but the March 2006 eruption was from the NE flank. According to a news report by Reuters, a JMA official stated that "gray ash was discovered on the snow around the summit, but no movement of lava was detected, and we do not think a large eruption is likely." Information Contacts: Yukio Hayakawa, Gunma University, 4-2 Aramaki-machi, Maebashi City, Gunma, 371-8510, Japan (URL: http://www.hayakawayukio.jp/English.html/); Japan Meteorological Agency, Kishocho-881, 3-4 Ote-machi, Chiyoda-ku, Tokyo 100-0004, Japan; Reuters Foundation Alert Net (URL: http://www.alertnet.org/). A minor eruption on 21 March 2006 produced minor ashfall around the summit (BGVN 31:02). This report begins with activity seen at the Akan volcanic complex (figure 8) on 29 September 2008, which included a four-minute seismic tremor at Me-Akan, prompting the Japan Meteorological Agency (JMA) to raise the Alert Level to a "near-crater warning." The number of earthquakes had increased since 26 September. A white plume rose less than 100 m above the Me-Akan volcano group, which is part of the Akan volcanic complex. Figure 8. A map of Akan with translations for some of the critical features of interest. Courtesy of JMA. On 17 October, JMA lowered the Alert Level to normal. Seismic tremor was no longer detected after 30 September, and seismicity had remained low after 3 October. On 17 November, JMA again raised the Alert Level to "near-crater warning" after the seismic network detected tremor that lasted 171 minutes. On 18 November the summit was obscured by cloud cover, but web camera views showed that the snow-covered S slopes had turned black. During an overflight later that day, JMA scientists noted that the ash covered an area up to 400 m away from Ponmachineshiri crater on Me-Akan volcano. Ballistic lithics several tens of centimeters in diameter were deposited around the crater. On 28 November Me-Akan erupted again (figures 9 and 10). An ash plume rose to an altitude of 2 km and drifted N, E, and SE. According to JMA, ash was deposited on the E flank up to 4 km away from the crater, and the black ash cover on snow surface appeared wider and thicker than on 18 November. Figure 9. Part of the Akan volcanic complex as seen from the air looking NW at 1134 on 28 November 2008. The snow-covered slopes contain a distinct darkened area due to the presence of fresh ashfall (indicated with arrow). The larger plume at right originates from the 96-1 crater in the Ponmachineshiri crater. The smaller steam plume at left is commonly seen; it comes from a vent on the NW slopes (which were active in 1996). Courtesy of JMA. Figure 10. A view of Me-Akan from the S taken at at 1151 on 28 November showing views of steam emissions from both the "96-1 crater" (crater ##1 of 1996) and the number 4 crater. Courtesy of JMA. Information Contacts: Volcanological Division, Seismological and Volcanological Department, Japan Meteorological Agency (JMA), 1-3-4 Ote-machi, Chiyoda-ku, Tokyo 100, Japan (URL: http://www.jma.go.jp/). Eruptions are common at Akan, with recent eruptions in 1984, 1988, 1996, 1998, 2006, and 2008. Monthly observation reports from the Japan Meteorological Agency (JMA) after the 1998 eruption indicated that seismicity was persistent but often low over the following eight years, with earthquake swarms in 2002-2003. Although the eruptions in 2006 (BGVN 31:02) and 2008 (BGVN 33:10) were described previously, the detailed seismic data noted below were not. Volcanic earthquake swarms were recorded during 18-23 January, 8 February, and 29-30 March 2002. Seismicity was high again during 1-11 January, 13-15 April, 19-20 August, 24-25 September, and 8-23 October 2003. No further episodes of increased seismicity were recorded until February 2006. Two earthquake swarms in early 2006, on 18-19 February (more than 1,100 events) and 11 March (more than 600 events), preceded an eruption on 21 March. This small eruption from the NE flank of the Me-Akan cone on 21 March 2006 deposited ash on the snow 10 km SE of the summit (BGVN 31:02). Another volcanic earthquake swarm during 9-10 May 2006 consisted of over 900 events, but no ash plumes followed. Although seismicity was above background levels in January-February 2007, no distinct swarms were noted that year. Elevated seismicity was again recorded on 10 January 2008, when 471 volcanic earthquakes were detected. A volcanic tremor event on 16 September preceded a seismic swarm during 26-30 September 2008 (with a high of 788 events on the 29th). Another tremor event on 29 September prompted JMA to raise the hazard status (BGVN 33:10). Although seismicity dropped in early October 2008, 79 volcanic earthquakes were detected on 12 October, and activity was higher again during 19-27 October. An earthquake swarm during 9-12 November (high of 241 events on the 10th) was followed by 14 tremor events between 16 and 28 November. A single tremor event lasting 171 minutes on 17 November again prompted an Alert Level increase by JMA, and, the next day, S-flank ashfall was observed (BGVN 33:10). A grayish white ash plume rising above the crater on 28 November resulted in additional ashfall (BGVN 33:10). Seismicity declined significantly after 17 December, before beginning a gradual increase on 5 January 2009. On 29 January 2009, there were 155 volcanic events, and a total of 1,785 for the month. Seismicity declined gradually during February-March, back to less than 100 events per month in April. Other than volcanic earthquake swarms on 8 July (357 events) and 6 September (358 events), seismicity remained low through the end of the year. Akan is a 13 x 24 km caldera located immediately SW of Kussharo caldera. The elongated, irregular outline of the caldera rim reflects its incremental formation during major explosive eruptions from the early to mid-Pleistocene. Growth of four post-caldera stratovolcanoes, three at the SW end of the caldera and the other at the NE side, has restricted the size of the caldera lake. Conical Oakandake was frequently active during the Holocene. The 1-km-wide Nakamachineshiri crater of Meakandake was formed during a major pumice-and-scoria eruption about 13,500 years ago. Within the Akan volcanic complex, only the Meakandake group, east of Lake Akan, has been historically active, producing mild phreatic eruptions since the beginning of the 19th century. Meakandake is composed of nine overlapping cones. The main cone of Meakandake proper has a triple crater at its summit. Historical eruptions at Meakandake have consisted of minor phreatic explosions, but four major magmatic eruptions including pyroclastic flows have occurred during the Holocene. Hasegawa T, Nakagawa M, 2007. Stratigraphy of Early to Middle Pleistocene pyroclastic deposits around Akan caldera, eastern Hokkaido, Japan. J Geol Soc Japan, 113: 53-72 (in Japanese with English abs). Tamada J, Nakagawa M, 2009. Eruption history of Oakan volcano, eastern Hokkaido, Japan. Bull Volc Soc Japan (Kazan), 54: 147-162 (in Japanese with English abs). Volcanological Society of Japan, 1999. Report on volcanic activities and volcanological studies in Japan for the period from 1995 to 1998. Bull Volc Soc Japan (Kazan), 44(Suppl): 1-76. Wada K, 1995. Fractal structure of heterogeneous ejecta from the Me-akan volcano, eastern Hokkaido, Japan: implications for mixing mechanism in a volcanic conduit. J. Volcanol. Geotherm. Res., 66: 69-79. There is no Deformation History data available for Akan. There is no Emissions History data available for Akan. 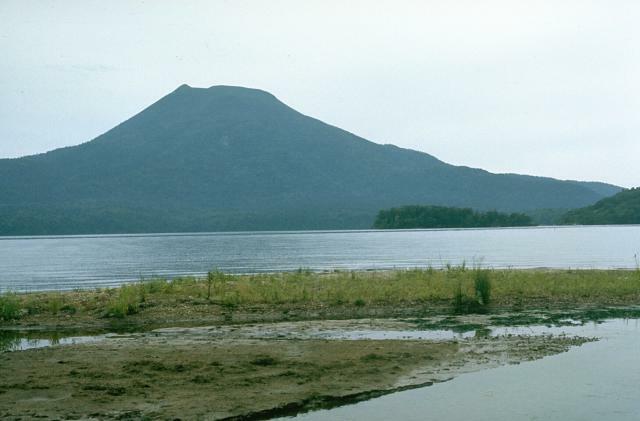 O-Akan stratovolcano, the largest post-caldera cone at Akan volcano, is seen here from the west across the Akan caldera lake. It was constructed at the NE end of the 13 x 14 km caldera, opposite a cluster of stratovolcanoes at the SW end. No historical eruptions have occurred from O-Akan, although Me-Akan, in the SW group, has been frequently active. O-Akan, the prominent peak at the right, is the largest of a group of stratovolcanoes constructed within the 13 x 24 km Akan caldera. It is seen here from the east, with the Me-Akan volcano group, which occupies the opposite, SW side of the caldera, on the distant left horizon. 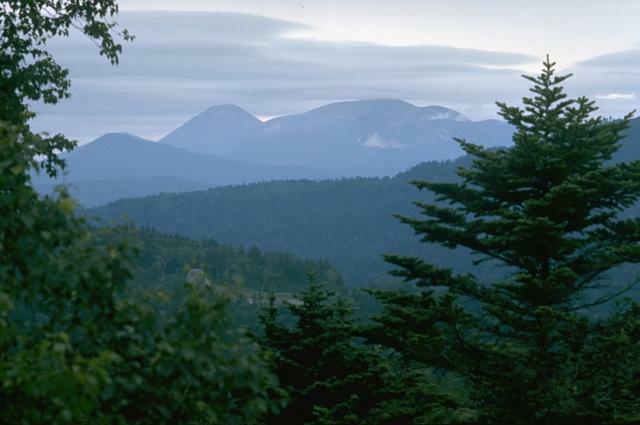 Akan caldera is the southernmost of a group of three large calderas in NE Hokkaido. Me-Akan volcano (left center) rises above Lake Akan to its NE. Along with Fuppushi volcano (right), it is part of a cluster of 9 stratovolcanoes that occupy the SW side of the 13 x 24 km Akan caldera. The summit of Me-Akan contains the active craters of Ponmachineshiri and Naka-Machineshiri, which have been the sites of frequent phreatic eruptions in historical time. Me-Akan volcano (center) is flanked on the left by Akan-Fuji, one of many symmetrical Japanese volcanoes named after the renowned Mount Fuji. Me-Akan and Akan-Fuji are part of a cluster of 9 stratovolcanoes constructed on the SW side of Akan caldera. Akan-Fuji has not erupted in historical time, although Me-Akan is one of the most active volcanoes of Hokkaido. The Me-Akan volcano group, east of lake Akan, is the only site of historical activity in Akan caldera. Me-Akan (center) is seen here with the symmetrical Akan-Fuji volcano to the right. They are part of a group of stratovolcanoes constructed within the 13 x 24 km, elongated Akan caldera, which formed more than 31,500 years ago immediately SW of Kutcharo caldera. 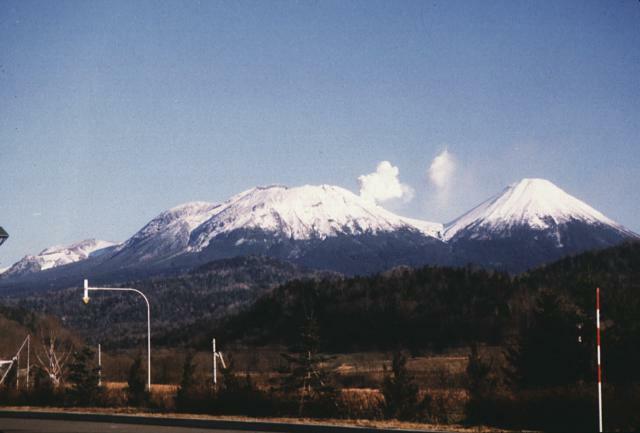 The Me-Akan group has produced mild phreatic eruptions since the beginning of the 19th century, including two days before this November 23, 1996 photo. Photo by Wataru Hirose, 1996 (Hokkaido University). Large Eruptions of Akan Information about large Quaternary eruptions (VEI >= 4) is cataloged in the Large Magnitude Explosive Volcanic Eruptions (LaMEVE) database of the Volcano Global Risk Identification and Analysis Project (VOGRIPA).